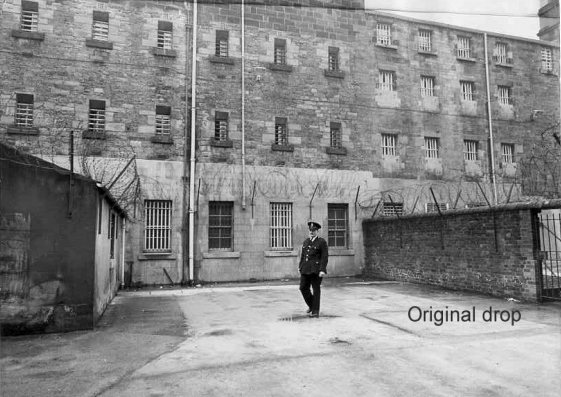 Following the limited success of the first private execution in the North East, the authorities were not called upon to the enact the dread sentence for another four years. But, as if to compensate for the gap, four men were to meet this grisly fate on the same day. The four were Hugh Slane, John Hayes, George Beesley and Terence Rice and they were all indicted for the murder of Spennymoor resident Joseph Waine; Consequently, gaining them the ignominious sobriquet of the Spennymoor Murderers. One of the characteristics I have noticed of crime reporting, particularly capital crimes in the region, is how often, from about the 1820’s onwards, the crimes are linked and referred to by the region as if the stain of the crime resides in the community. Justice Denman has caused quite a sensation in legal and other circles by the severe sentences he passed at the Durham Gaol Delivery last week. The hon. judge has, ever since he came to occupy a seat on the bench distinguished himself by severe sentences. Newcastle Courant on Justice Denman 17th December 1875. We cannot help thinking that Mr Justice Denman is too severe in his severest moods, and, too lenient in his lenient moods. every conviction for murder was accompanied by at least one petition for the death sentence to be commuted to imprisonment – often featuring members of the jury that had convicted. In the case of the Spennymoor murderers, even the condemned supported each others claims of innocence. With the execution date of Monday 6th looming, A Whitehall Official delivered news on the 4th January that the Home Secretary, H.Austin Bruce, had seen fit to commute the capital sentences for Rice and Beesley to penal servitude for life. Slane and Hayes were not to be so lucky. The reprieve met with approbation from the Newcastle Courant. The paper feared that the reprieve would undermine the might of the law and as a result the execution itself would carry little weight. 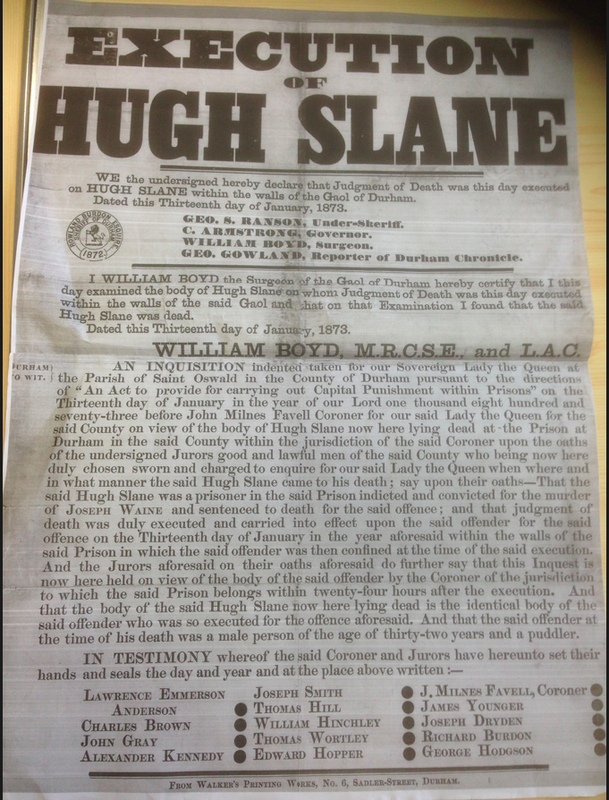 Hugh Slane and John Hayes will probably be hanged, but we very much doubt whether the people of Durham will receive a tithe of the benefit from the terrible example which they would have done if the administration of the law instead of inducing a belief that murder is a lottery, in which it is quite as likely that one may not be hanged for murder as that one may, had impressed the treacherous savages who have blackened the name of the county with the conviction that there is no evading the arm of the law, and that every penalty incurred will be rigorously exacted without regard to the position or numbers of the offenders. we know not as yet at whose door the blame should lie, but somebody must be responsible. First we were told that the execution could not be held at Durham on Monday because Calcraft was engaged to hang the Kirkdale Murderer at Liverpool on that day, though how nothing had been known of this at Durham up till Saturday there was no explanation. Then came the intellignece that the Liverpool execution had been postponed on account of the supposed intention of the hangman to be at Durham on the day fixed, the perplexity caused by which was not abated by the information that Calcraft himself, unaware of the alteration of date, had arrived at Liverpool to fulfill his engagement there. The unexpected delay from the postponement had the adverse effect of arousing sympathy for the two condemned men who had been denied clemency. Having previously only been shown “meager (sic) support in this district”¹ their prolonged suffering caused by the extension of the execution date was the subject of much sympathy. The delay greatly angered an already frustrated Newcastle Courant who believed that the unnecessary prolonging of Hayes and Slane’s agony was lamentable. Blundering like this might be considered ludicrous did it only entail the loss of a few pounds, but where it not only lengthens by seven more weary days the terrible fortune so vividly depicted by Victor Hugo, which racks the frames of those condemned to die, but once more awakes in their breasts the spark of hope only to be once more remorselessly extinguished, no other adjective can adequately describe it than disgraceful. I never dreamt for a moment-nay, I was horror-struck when the execution had to be postponed, and that the poor wretches had to suffer a week’s misery both in body and mind. From the beginning of the tragedy at Spennymoor on November 16th to its anticipated close on January 13th, England has nothing to be proud of. Given the negative coverage in the build up to the execution, the event itself would’ve had to have been a seamless enactment of justice to avoid further approbation and derision in the press. Sadly, it was not. Shortly before 7:30am on the Monday morning of the execution, a small group of reporters and officials were congregated outside the prison. Perhaps unsurprisingly, given previous events, the talk amongst them included the possibility “of any extraordinary incident attending the dreadful scene.”² On the stroke of 7:30am they were all admitted into the prison and led to the office of the Prison Governor, Lieut Colonel. Armstrong until an adjournment was made to the schoolroom, where the pinioning was to take place. Hayes submitted to the pinioning quietly, but whilst Slane was being pinioned Hayes began to address the assembled reporters. The Newcastle Courant reported him as saying he was “very glad to see the reporters present, and he was happy to die. He stood there innocent of the murder of Joseph Waine.” Thanking the attendant Catholic Minister and all the presiding officials for their kindness he continued to express his innocence and said he would be “very glad for reporters to see the paper he had left” being, as he was, “not qualified to speak it.” His Chaplain, Canon Consitt, said he would see to it that the press received it and when Slane pushed for it to be read then and there the Canon stated, “not at present my dear fellow, but I will take care that it is done.” Hayes proceeded to continue exhorting his innocence and seemingly buoyed by Hayes, Slane then “poured out rapidly a statement of his innocence.”³ These recitations of innocence flew in the face of the contrite and quiet submission to the sentence by the condemned that was expected of a seamless execution. As with the rest of the sorry affair, the execution itself did not run smoothly. Administered by Calcraft, the architect of many a botched send off, the two men were hanged on the same cross beam, Hayes had been allowed a drop of about two feet and initially both appeared to have “died almost without movement.” However, it appears that Slane’s drop was slightly shorter, “the effect of which was to spin his body round and round” Calcraft was forced to step in to steady the body which seemed to settle it, but no sooner had he achieved this, a “slight tremor” gripped the body of Hayes and then “a quivering motion extended over all his body.” Although it only lasted for a matter of seconds, the Courant said that those “four seconds…seemed like minutes to the horror-stricken spectators.”³ With that the bodies were left to hang for the requisite hour and an inquest put an end to the tragedy. The combination of a last-minute double reprieve, administrative errors in the setting of the date leading to an extension of the suffering of the remaining two condemned and Hayes’ rank refusal to accept guilt all conspired to present a shambolic spectacle of justice. All the central elements of the public executions of old, so abhorred by the architects of the 1868 Act, had been laid bare by a regional press given unprecedented and seemingly unfettered access. The fatal combination of the undermining of the majesty of the law and its representatives through a confused last-minute appeal and delay, to the refusal to accept guilt or the justice of their sentence by the condemned and the horror of a botched execution meant that this was to be the last execution in Durham to which full access was granted in the period and the penultimate execution to which any admittance was allowed at all. As a teenager I was a big fan of Nirvana. I started to learn the drums at the age of 16 and Nirvana and the Smashing Pumpkins were the first bands i tried to learn the parts for – the songs escape me (Smells Like Teen Spirit and Bullet with Butterfly Wings, respectively, would be my guess). I think those song choices alone may conjure an innaccurate image of the sort of teenager i was, being as I was just as at home with Simon and Garfunkel and John Martyn (they’re just not as fun to drum too!). Anyway, the point i’m getting to is that I saw a documentary at the Tyneside Cinema this week about Kurt Cobain entitled Montage of Heck. I believe it is the only film about his life fully authorised by his remaining family. As such it had exclusive access to reams of home movies, demo tapes and unseen clips. It’s a very difficult film to claim you enjoyed as it is deeply affecting and the knowledge of his tragic end hangs like Banquo’s ghost over the whole two hours. As such, the most accurate thing I can say is that it’s an exhausting but worthwhile watch. I think the best way to remember such a tragic figure is through their work and, speaking as a drummer – a very average one mind, this is one of my favourite tracks.